To commemorate 30 years of Snow Cap, Pyramid Breweries is releasing three different version this year. Also, they’re giving away 30 flight vouchers with Alaska Airlines. Plan a holiday getaway or go visit friends and family. To enter, simply text “SNOWCAP30” to 55678. Winners will be drawn weekly through December. On Saturday, November 12 there will be a Snow Cap Party at the company’s Seattle Alehouse. Why is this cool, you might be asking? Seems odd by today’s standards but that was reality in the late 80s and early 90s around Seattle. Back in those days, the annual release of Pyramid’s Snow Cap was a cause for celebration. There weren’t many breweries making big, bold winter beers. We always got excited to find out how strong Snow Cap would be each year. It just seemed to get stronger and stronger ever year. Of course, by today’s standards it wasn’t really all that strong. Still, the release of Snow Cap was a big deal. Fast-forward to the current beer world and it’s not at all unusual for a brewery to make big, strong winter beers. Still, there’s nothing wrong with showing a little love for those who started the whole thing. Here’s more information in the form of a press release about Snow Cap’s 30th anniversary. 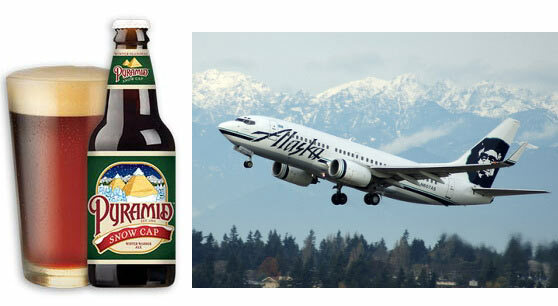 SEATTLE (November 3, 2016) – Pyramid Breweries today announced the launch of not two, but three special releases in celebration of the 30th Anniversary of Snow Cap. Snow Cap, Super Snow Cap and the limited release, Bourbon Barrel-Aged Snow Cap, make up Pyramid’s Snow Cap family of brews to celebrate this meaningful milestone three decades in the making. The very first version of Snow Cap totally blew my mind! it was by far the best beer I had ever had to date.